A laser system has to meet special requirements to project illuminations and logos onto facades at night. Laserworld has now presented the PL-5500RGB Outdoor professional laser system, specially designed for outdoor logo, text and architectural projections. Rain, wind, and snow – outdoor systems have to withstand plenty. 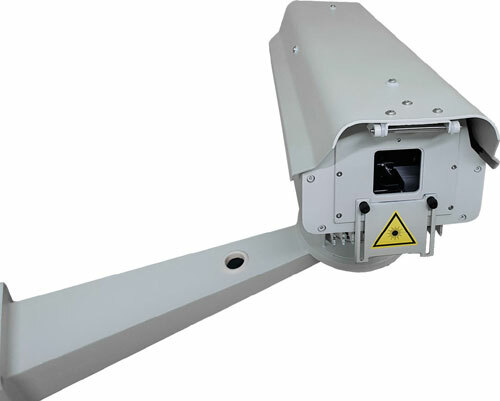 An integrated rainproof housing allows laser systems to be set up as a fixed installation. At the same time, the show laser is cooled by lower, external cooling fins. This reduces the maintenance costs. The system contains an integrated control interface that can also be used to load laser frames and animations. At the same time, the reliable diode technology and the quick scanner ensure clear logo and patter projections. With the PL-5500RGB Outdoor laser system, architectural projections, laser mappings or logos can be displayed in an ideal and clear manner. Due to the strong 5’500 mW (after optics), the projections are highly visible in the dark. The animations and laser frames can be controlled automatically through a timed show using a timer or directly with a computer. Live control of the system is also possible for events. The show laser, which can be easily augmented by individual logos, text, or graphics, has a good white balance, with linear color fading behavior and high visibility. The complete system has a beam diameter of about 5.0 mm and a beam divergence of ca. 1.1 mrad. The guaranteed output power at aperture is 5’500 mW. The power is distributed to 1’100 mW / 638 nm (red), 1’600 mW / 520 nm (green), 3’000 mW / 450 nm (blue) according to optics. Fast scanners work at 35 kpps@8° ILDA and the maximum scanning angle is 50°. The complete laser is configured via the integrated Pangolin FB4 interface. Whether an impressive laser show at a festival or laser advertising on the façade of your company headquarters – the PL-5500RGB outdoor system is ideal for projecting lettering and animations.